A team of scientists conducting biodiversity survey in the ancient church forests of Ethiopia made an unexpected discovery—a rather infamous ant species Lepisiota canescens displaying signs of supercolony formation. According to D Magdalena Sorger, a post-doctoral researcher with the North Carolina Museum of Natural Sciences and a key member of the team, the discovery is significant for two reasons. First, supercolony formation in ants is rare, with documented cases of only around 20 species worldwide. Second, other species in the Lepisiota genus have recently made headlines for being invasive: in South Africa's Kruger National Park and Australia's Darwin Port that shut down for several days. The team's finding, was published in Insectes Sociaux released on November 22. In Ethiopia, forests surround Orthodox churches, some of which are more than 1,500 years old and these forests range in size from few hectares to over 400 hectares. “These forests can be considered relict oases within largely barren land and agricultural fields. While L. canescens is native to the general region, it is now moving in large numbers into disturbed habitat like some of the more degraded church forests, but also beyond forest boundaries, into neighbouring agricultural fields, and along recently constructed roads and other urban structures,” says the report. This might be just the beginning, says lead author Sorger. "The species we found in Ethiopia may have a high potential of becoming a globally invasive species. Invasive species often travel with humans, so as tourism and global commerce to this region of Ethiopia continues to increase, so will the likelihood that the ants could hitch a ride, possibly in plant material or even in the luggage of tourists. All it takes is one pregnant queen. That's how fire ants started," he explains. Supercolonies are colonies that extend beyond just a single nest and can sometimes cover many thousands of miles. The strongest basis for describing a large colony as a supercolony is its capacity to expand its range without constraints. “There are several supercolonies of L. canescens, the largest one spanning 38 kilometres. Molecular analysis of these ants showed lots of genetic diversity within and between supercolonies, indicating supercolony members were not more closely related and this species was native to the region. 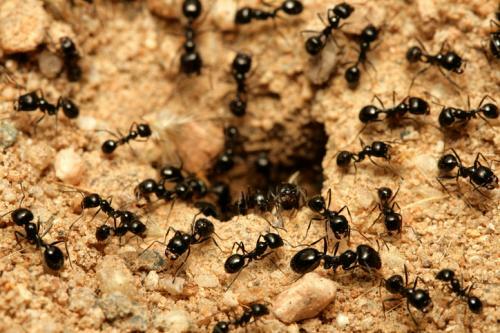 While these are the largest documented supercolonies of a native ant species, yet their exploding numbers, along with their observed ecological dominance as well as general nesting and diet, are all characteristics reminiscent of an invasive species,” says the report. “Ethiopian church forests might be ground zero for a new dominant ant species with high global invasion potential, and the data we are collecting on this species could become critical in the case of an invasion. It is good to have a record of what this species does in its native habitat," Sorger says. "Rarely do we know anything about the biology of a species before it becomes invasive,” he adds. Is genetic engineering the right way to cure the problem of invasive species?